Experience cheesy goodness while eating smart with Cheesy Smashed Potatoes. Our Cheesy Smashed Potatoes use reduced-fat sour cream and 2%-milk cheese. Cook potatoes and cauliflower in boiling water in large saucepan 20 min. or until vegetables are tender; drain. Return vegetables to pan. Add sour cream; mash until vegetable mixture is fluffy and ingredients are well blended. 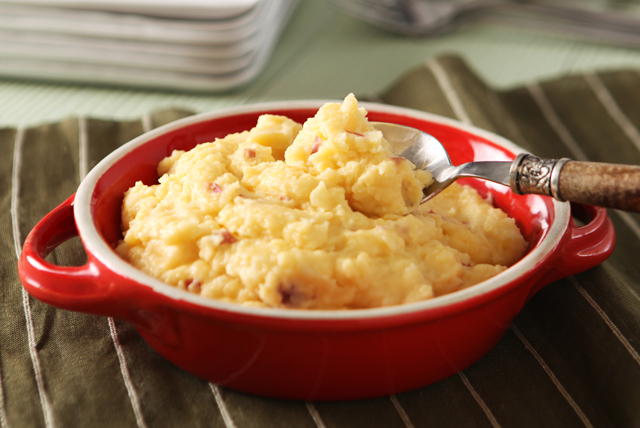 Place potatoes and cauliflower in large microwaveable bowl; add enough water to completely cover vegetables. Cover bowl with waxed paper. Microwave on HIGH 20 min. or until vegetables are tender. Continue as directed.